Australian customers will benefit from an upgraded hydraulic transmission retarder by the middle of next year, says Scania. The truck giant’s new R4100D retarder now automatically disengages and "freewheels" when not in use to save on fuel. "This reduces drag losses because both vaned wheels that provide braking power when rotating in oil are disengaged," the company says. "Actual fuel savings will vary depending on road conditions, but an average of a half per cent reduction is taken as the rule of thumb. "The driver doesn’t have to do anything. When braking power is needed, the free-wheeling stops and the engagement takes place smoothly and immediately using a type of synchronisation that is similar to that in Scania gearboxes. "Besides comfort and a relaxing drive, it also provides savings by extending the working life of brake linings and braking components." Scania says the freewheeling retarder also provides higher braking power: 4,100Nm instead of 3,500Nm. There is also an increased braking effect at lower engine revs with the help of higher gear ratios. "Reducing fuel consumption is Scania’s main priority," says Örjan Åslund, responsible for Product Affairs at Scania Trucks. 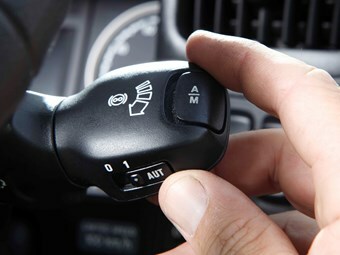 "The activation of the retarder itself is either initiated by the driver – via a lever on the steering column or with a light touch of the brake pedal – or when the cruise control requests braking," says Åslund. "As soon as the retarder is not in use, it freewheels again on its own. But it remains ready to smoothly and firmly change from free-wheeling to full braking power in no time."